A dangerous heat wave baked a large swath of the nation from Texas to New York on Thursday, forcing football players to move practice sessions into the evening and election officials in Tennessee to lure voters with air-conditioned polling places. High humidity had the heat index  a measure of how hot it feels  at more than 100 degrees in many places, and heat advisories were in effect for 18 states. At least 13 deaths in Tennessee and Mississippi were blamed on the recent stretch of steamy weather. The hottest air of the summer has moved into the mid-South, the National Weather Service said. 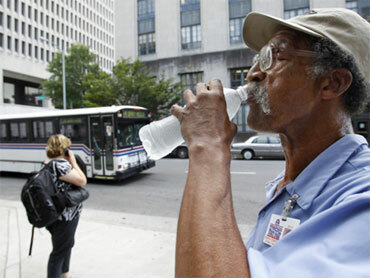 Forecasters called the heat wave dangerous and urged people to avoid outdoor work, drink lots of liquids and stay cool. "This heat wears on everybody," said Sandy Shamburger, who runs Rankin Sod Farm in Brandon, Miss. "We rigged up lights on a sod harvester so we can work at night." In Louisiana, not even nightfall has brought much relief. Louis Armstrong International Airport outside New Orleans recorded its highest minimum daily temperature ever Tuesday when the mercury didn't fall below 84 degrees, according to the National Weather Service. Temperatures at the airport dipped below 80 degrees Wednesday for the first time in five days as a band of showers cooled off the New Orleans area. And the heat isn't limited to the Deep South, where people are more accustomed to scorching temperatures. It's been a particularly steamy summer in the nation's capital, where temperatures have hit at least 90 degrees on 45 days so far, said weather service meteorologist Heath Sheffield. There were only 22 such days last year. Chris and Ingrid Hayes had stopped Thursday morning to take a picture in front of the White House with their three children  before the heat really ramped up. They planned to work their way to the National Mall as it got hotter to stop inside the many air-conditioned museums. Chris and Ingrid Hayes, visiting the capital with their three children from equally hot Atlanta, stopped to take a picture in front of the White House on Thursday morning. "We're hoping that helps break up the heat," Ingrid Hayes said. However, Sayed Arngbar said the heat doesn't bother him. He has operated a food cart on the corner of 14th and L streets in northwest Washington for 23 years. "For me, it's not a problem. I have a fan, I have all the windows open," Arngbar said, standing inside his cart Thursday morning. "For some people it's just too hot, they don't work. If it's 100 degrees outside, it's 120 in here." In neighboring Virginia, Richmond has recorded 10 days of 100-degree temperatures  the most ever. Tennessee is holding state primary and local general elections, with highs forecast at 101 degrees in Memphis and 98 in Nashville. Election officials encouraged voters to turn out by stressing that ballot stations are air conditioned. In Memphis, Mayor A C Wharton has urged people to be "nosy" and check in on their neighbors during the heat wave. The city has set up four community centers as cooling centers for people without air conditioners, and the Shelby County Community Services Agency was to hand out 300 air conditioners. In Mississippi, three heat-related deaths were reported  a man who had a heart attack while mowing his lawn; a construction worker who was spreading concrete; and an elderly woman who died of heat stroke while sitting on a relative's back porch. Animals have also fallen victim to the extreme heat. A police dog died Wednesday from heat exhaustion in Tennessee's Blount County after a search for two burglars. A deputy and another dog, also from the Blount County Sheriff's Office, were treated for heat exhaustion. "We also got a call from a Fayette County, Ga., handler who said he lost his K-9 from the heat Tuesday," said Blount County Sheriff's Department spokeswoman Marian O'Briant. Temperatures in Mississippi have surpassed 100 degrees in recent days and may have been to blame for the death of a 37-year-old Southern White Rhinoceros at the Jackson Zoo. Meanwhile, seven puppies died Wednesday while in the cargo hold of an American Airlines jet in Tulsa, Okla., said airline spokeswoman Mary Frances Fagan. The flight was supposed to leave for Chicago at 6:30 a.m. but had been delayed an hour because of storms there. By that time it was already 86 degrees outside.